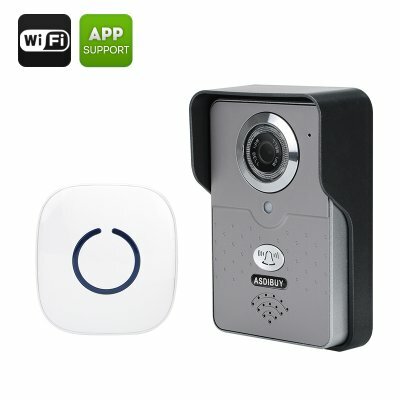 Successfully Added Asdibuy Smart Wifi Video Door Phone - Motion Detection, Night Vision, iOS + Android Support, Two-way Communication to your Shopping Cart. See who’s at the door and interact with visitors before you open the door with the Asdibuy Smart Wi-Fi Video Door Phone. Coming with 720P resolutions. The smart wireless door phone will make your everyday life more convenient and hassle-free. Super easy-to-set-up and use, it’s ready to be used right away. The video door phone comes with 720P resolution and will always give you clear video feedback of what’s happening on the other side of the door. Thanks to the 1/4 CMOS sensor, the door phone’s cam can also take clear snapshots of your visitors. With 10-meter night vision, you will be able to clearly see your visitors even after dark. Sitting at home waiting for an important delivery is no fun. With the video door phone, you won’t have to. Simply go about your day and you will be instantly notified when you have guests at the door. Two way audio means you can even communicate with the guest and this door phone is compatible with both Android and iOS platforms. The Wi-Fi door phone comes with motion detection and supports 4 detection areas. Should you have any unexpected visitors, it will take a snapshot of the person and instantly send to your email. The Asdibuy Smart Wifi Video Door Phone comes with a 12 months warranty, brought to you by the leader in electronic devices as well as wholesale video door phones..